We have all enjoyed playing a bean bag toss game when we were young...or not so young. It's a classic childhood game. Since throwing, aiming, and counting are involved, a bean bag toss game is quite interesting on a developmental level. Gross motor skills, hand-eye coordination, and even the ability to count the number of points and compare results are also part of the fun. 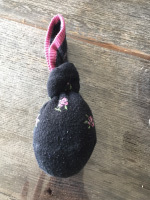 These aspects are precisely what children will develop with this simple homemade bean bag toss game you can make in just a few easy steps. You may already have a store-bought version of this game that involves a wooden board with holes cut out of it through which children must try to toss colourful bean bags. Whether you have one or not, I suggest creating your own game, just for fun (and learning). 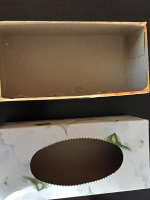 1) Gather your empty tissue boxes. Make the opening on each box bigger by removing the plastic film. 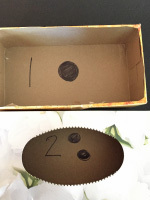 If needed (with younger children), you may also cut the top of the box off completely. 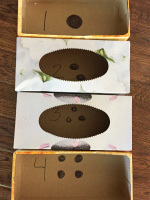 2) Inside each box, write a number (no higher than 5 for preschoolers). In fact, I suggest you write a number AND draw the corresponding number of dots that children can count. 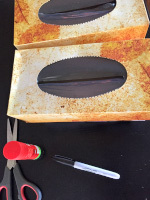 3) Glue the tissue boxes together. You decide what shape you wish your bean bag toss game to have. The possibilities will depend on the number of boxes you have. 4) Hang the boxes on a wall, indoors or outdoors. Trick: If you already have bean bags, use them. 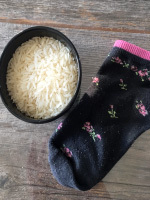 If not, fill children's socks with rice and tie a knot to easily create simple bean bags your group can use to play.